With spring upon us and the weather warming up; we are coming closer to planting those beautiful gardens that we would love to have in our backyards. However, you need to plan ahead and make sure you know what you’re planting, where it is being planted and the best course of action to take when the weather allows for you to start planting. While they don’t come back year after year like perennials do, annuals are a great way to add color quickly. Annuals are brightly colored, beautiful flowers to have. They are also plentiful, and you can have a wide assortment of plants that can thrive next to each other around your home. But many perennials also have gorgeous, colorful flowers, and they don’t require replanting every year. Remember these flowers when you start planning your garden ahead of time. Choosing the types depends on the look and feel you’re going for. Here are a few flowers, and their uses when it comes to being in a garden. 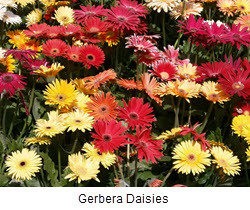 Gerbera Daisies – These beautiful flowers provide that ‘pop’ you’re looking for in your garden. They are brightly colored and very attractive. Once planted, they will come up almost every year with the same brilliance. Marigolds – These blooming annuals come in yellow, orange, and cream colors. They thrive in sunny moist places, and a lot of people like to plant them around their homes. They can also thrive in raised bed gardens or as potted plants. Marigolds come in compact dwarf varieties as well as taller plants that will spread. While marigolds are grown as annuals, if you leave the flower heads on until they drop, they often will re-seed themselves and come back next year. Black-Eyed Susans – Adding these to your garden can provide the filler flowers that you’re in need of. They have plentiful blooms can and fill in gaps where other flowers are not. They are a tough, hardy plant to put in the garden and require minimal care. They only need partial sunlight and thrive among the other flowers. They give that natural, willowy look to your garden, if that is what you desire. Black-Eyed Susans are very hardy perennials. When you want help designing and planning the perfect garden in the backyard of your Twin Cities home, speak with us here at Architectural Landscape Design. We are a licensed landscaping design and installation contractor for the Minneapolis and St. Paul area. We can walk you through many beautiful design options and work out a plan to get you started before it is time to put those flowers in the ground.